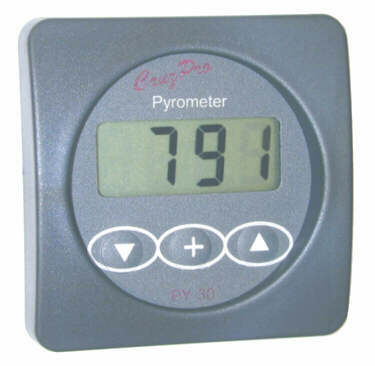 The PY60 pyrometer displays engine exhaust gas temperature in degrees F or C. It comes with an 1100 deg C type K thermocouple. 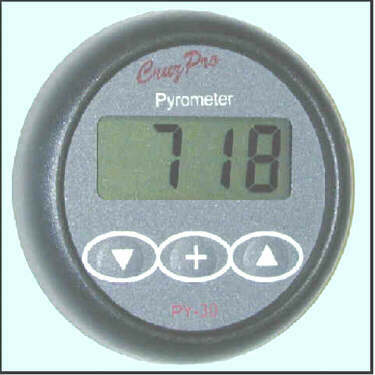 Low and High temperature alarms can be set over the entire range of the instrument. When activated, the PY60 built-in 85 dB alarm will sound and the display will flash. The alarms can be enabled or disabled with a single key press. Five levels of backlighting can be selected and all set-up, calibrations constants, alarm values and Max. temperature seen is saved to non-volatile memory. Data is output on an NMEA 0183 compatible serial data output. With a press of the button you can display exhaust gas temperature (in deg F or C), High and Low temperature alarm set-points, and Maximum temperature seen (since last reset). 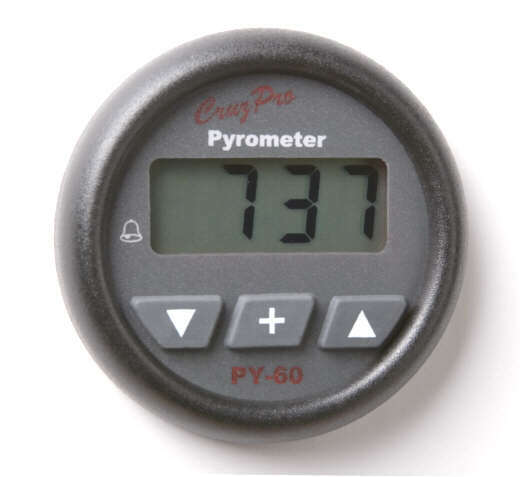 The PY60 draws only 0.017 amps and 5 levels of backlight (including OFF) can be selected from the front panel and is saved to non-volatile memory. The PY60 outputs temperature on the standard NMEA 0183 serial data line at 4800 BAUD. This ASCII information can be used to log performance or repeat the display information at a remote location on the CruzPro RP30 and/or RP110 data repeaters (see www.cruzpro.com/rp30.html and www.cruzpro.com/rp110.html). If NMEA 0183 serial data is not required, then the output terminal can be programmed as an external alarm output pin. The stock thermocouple shipped with the PY60 is a 65 mm (2.6 inch) long stainless steel 6.6mm (1/4 inch) diameter thermocouple with an insulated tip. The probe is supplied with a 12.7mm (1/2 inch) diameter 1/4" ID NPT compression gland. The part number for replacement thermocouples is TH-2. The maximum tip temperature is 1100 deg C (2000 deg F). Any isolated K-type or J-type thermocouple can be used with the PY60. Be sure to use an isolated thermocouple (the two wires coming from the thermocouple are electrically isolated from the metal thermocouple body). The wires exiting the thermocouple pot end are short. 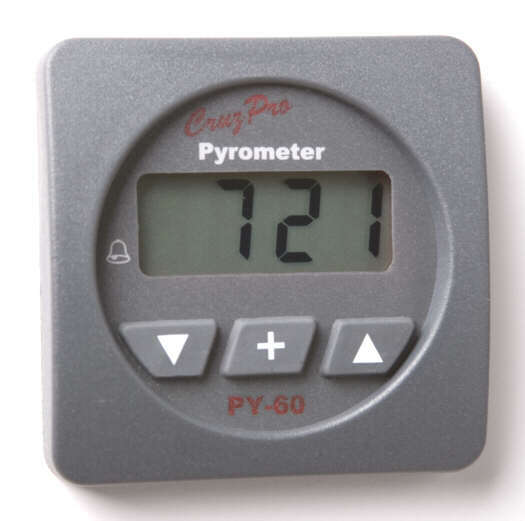 You will need an extension cable between the thermocouple and the PY60 display head. The electrical connections created by connecting the extension cable wires to the thermocouple wires will each create a new "thermocouple junction". If you use K-type thermcocouple extension leads then the voltage created by the two new junctions will cancel (if wired correctly) and have no effect on the displayed temperature readings. If the temperature variations of the additional thermocouple junctions are not excessive you might be able to use standard copper wire for the extension cable.